Unfortunately the House Armed Service Committee’s National Defense Authorization Act, H.R. 1540, would reverse this progress. Section 844 of the bill would actually allow the military to use alternative fossil fuels that produce more pollution than conventional fuels. The additional pollution would exacerbate global warming, which in turn would make our nation less secure. The House plans to debate H.R. 1540 over the next several days. Congress must remove this provision to enhance national security. 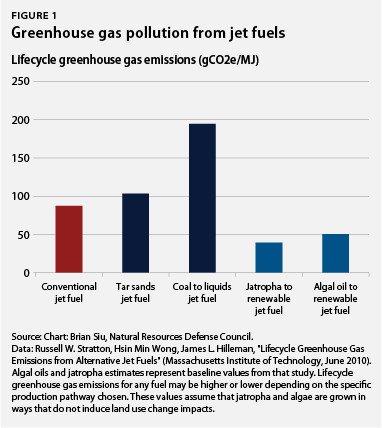 … an alternative or synthetic fuel, including a fuel produced from nonconventional petroleum sources … unless … the lifecycle greenhouse gas emissions associated with the production and combustion of the fuel supplied … be less than or equal to such emissions from the equivalent conventional fuel produced from conventional petroleum sources. This provision, Section 526 of EISA, forbids the military and other federal agencies from purchasing tar sands oil and “coal to liquids” that are dirtier than today’s fuels. (see chart) This spurred the military to research, develop, and deploy advanced biofuels that are cleaner than petroleum, made from biomass such as camelina and waste oils. … strengthens national security. By having reliable and abundant alternate sources of energy, we will no longer be held hostage by any one source of energy, such as petroleum. The Department of Defense adopted this approach. Navy Secretary Ray Mabus established five clean energy goals in October 2009. One critical goal is “by 2020, 50% of total DON [Department of the Navy] energy consumption will come from alternative sources.” This includes ensuring “that alternative fuels utilized have lower lifecycle greenhouse gas emissions than conventional petroleum-based fuels.” This will require 8 million barrels of advanced biofuels per year. The Navy is now working to make its goals a reality. Last year the Navy tested an F/A-18 fighter jet on a biofuels blend at supersonic speeds, and since then it has successfully tested helicopters and combat boats. The USS Makin Island also employs a hybrid electric drive that cuts fossil-fuel use. It will reduce the ship’s lifetime fuel costs by at least $250 million at today’s prices. This is a significant change for the Air Force. Before the passage of EISA, it was very interested in getting long-term contracts to purchase jet fuel made from liquid coal, which is significantly dirtier than conventional fuel. The Army uses less energy than the Navy or Air Force—only one-fifth of the energy consumed by the Department of Defense. It is focusing on using more fuel-efficient vehicles as well as exploring clean alternative fuels. The military can test various advanced biofuels to determine the most effective blend before they are commercialized. And it can do this more easily than private businesses because it can afford to experiment without concern about a short-term profit. It can then purchase enough to create market certainty for producers, thereby encouraging the production of larger quantities that will bring down prices. Secretary Mabus believes that the U.S. military should “take the lead” and that “the Navy can be a market” in biofuels use, which will help speed the development and commercialization of advanced biofuels for both military and civilian use. The Army notes that a military investment in clean energy technologies “creates new products, new business opportunities for a ready market. … [it] reduces R&D cost and risk of entry for commercial businesses.” And early adoption of these technologies by the Defense Department provides certainty to investors that there will be a market for new products. Earlier this year the Rand Corporation criticized the Defense Department’s efforts to develop and commercialize advanced biofuels for its vessels, aircraft, and vehicles. It argued that it was unrealistic to develop the quantity of advanced biofuels necessary for the military over the next decade. It recommended using liquid coal as an alternative fuel while ignoring the security impact of increasing global warming pollution. This study was criticized because it did not seek the views of the most senior Navy officials. We have been engaged with the biofuels industry. We know what they are capable of doing, and we are confident they will be able to deliver the fuels at the quantities and at the price point we need. Rand also reached its conclusions by mischaracterizing the biofuels program as focused on low-sulfur fuels rather than on advanced biofuels. Despite the national security imperative to reduce carbon dioxide pollution from burning petroleum-based transportation fuels, the pending National Defense Authorization Act would actually increase the use of such fuels. H.R. 1540 would exempt the military from Section 526, which would allow the military to purchase jet and other fuels made from liquid coal and Canadian tar sands instead of driving innovation in advanced biofuels. The Germans perfected the Fischer-Tropsch process to make liquid transportation fuels from coal during World War II. The lifecycle carbon dioxide pollution from liquid coal production is 118 percent greater than that of conventional gasoline. And even if carbon capture-and-storage technology is used to reduce CO2 pollution during liquid coal production—it currently isn’t—the combustion of liquid coal still produces nearly 4 percent more pollution than gasoline, according to the Environmental Protection Agency. … a viscous form of petroleum mixed with sand, clay, and water—is not easy to access. Deposits … lie between 100 and 150 feet below the surface. The ore is traditionally extracted by removing the overburden and strip mining, and it then is loaded onto trucks, crushed, and mixed with water—it takes two to four barrels of water for every barrel of bitumen—to form a slurry. … it’s a messy, energy-intensive process. Some argue that the United States should ignore the added pollution and increase the use of Canadian tar sands oil because Canada is our closest ally. They say this makes tar sands more secure than oil from Persian Gulf or African nations. Congress should speed the development and deployment of significantly cleaner domestic biofuels instead of spending tax dollars on dirtier fuels that accelerate global warming, which will foster unrest in nations impacted by global warming. One helpful step would be to lift the current five-year limit on federal purchase agreements for advanced biofuels and instead allow the military to sign long-term agreements. This would provide more certainty to manufacturers, making it much easier to secure financing for their production facilities. The longer contracts should only apply to the purchase of advanced biofuels as currently defined by the Clean Air Act. Section 526 of EISA must remain intact. This means that fuels must have lower lifecycle pollution than conventional petroleum fuels. A 10-year purchase contract is sufficient to provide certainty to investors. Longer contracts should be prohibited. Rep. Todd Akin (R-MO) has two pending amendments to H.R. 1540 to grant the Defense Department 20-year contract authority for the purchase of alternative fuels. This is twice as long as necessary to provide market certainty for advance biofuels manufacturers, but it provides the contract length sought by producers of coal-to-liquid fuels. The amendment is a companion to lifting the prohibition on military purchase of coal-to-liquid, tar sands, and other dirty fuels. The House should reject these amendments if they are offered. The recent rise in extreme weather events is a frightening window into the future. It heightens the urgency to reduce global warming pollution. The military is contributing to this effort by developing cleaner, alternative fuels. This will enhance national security as well as grow companies that will produce these fuels. We must also set aside alternatives—like fuels from tar sands or liquid coal—that significantly increase pollution. The House Armed Services Committee undermined national security by repealing Section 526 as part of its National Defense Authorization Act. It is incumbent upon Congress to restore this protection that reduces pollution while spurring the development of a domestic advanced biofuels industry for military and civilian use. *All three services are increasing electricity efficiency and investing in renewable electricity, too. But the focus of this column is the military use of advanced biofuels instead of fossil-fuel-based liquids due to the provision in H.R. 1540. Special thanks to Brian Siu at the Natural Resources Defense Council, and thanks to Kalen Pruss and the National Security Program at the Center for American Progress.